Happy hump day! Hard to believe the week is already half over! Continuing with some healthy, clean eating of 2014 I started the week off with this super easy, delicious and vegan meal! This dish single handedly turned me into a tofu lover. Back in the day you couldn’t pay me to eat the stuff but pairing it with spicy peanut dressing, crispy snap peas and water chestnuts… changes everything! This stir-fry is also so easy and quick to prepare, dinner is ready in 20 minutes! It was the perfect dish to serve for guests that came over to watch the season premier of the bachelor (don’t judge, its my guilty pleasure) because I barely spent anytime in the kitchen! Serve this dish over brown rice, quinoa or glass noodles and you’ve got a perfect weeknight or Meatless Monday dish! In a small bowl, whisk together peanut butter, soy sauce and lime juice until smooth. Add the water, sesame oil, cornstarch and chili paste and whisk until blended. Set aside. Coat a nonstick wok or large nonstick frying pan with cooking spray or sesame oil and heat over high heat. Add mushrooms and stir-fry until lightly browned (about 4 minutes). Add peas and saute another 3-4 minutes until bright green and tender-crispy. Add peanut butter sauce, water chestnuts and tofu and stir until the sauce thickens and coats everything. Cover and let simmer on low for 3-5 minutes. Serve over brown rice or other grain and garnish with cilantro. Enjoy! 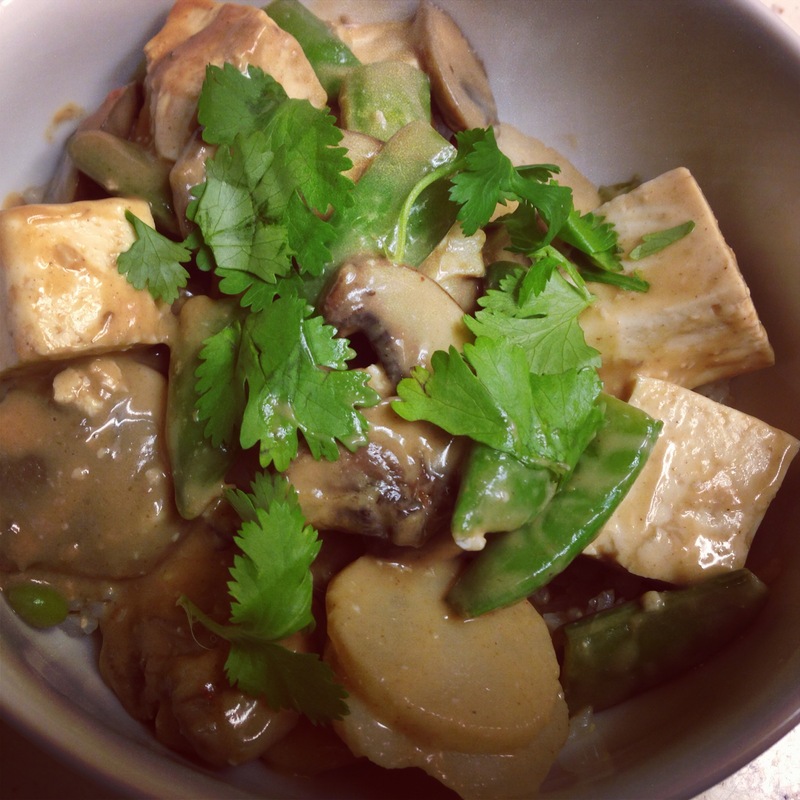 This entry was posted in Entrees, Family Favorites, PomPom Signature Dish, Recipes and tagged meatless monday, mushroom, peanut tofu stir-fry, snap peas, Spicy peanut sauce, stir-fry, tofu by skibootsinthekitchen. Bookmark the permalink.